Host made the tour enjoyable with lots of interesting stories about history of Palermo and it’s food. WOW WOW WOW... this tour is a MUST.. We really can not stress how amazing it was. Salvo you deserve a pay rise!! Firstly, Salvo thank you sir you was INCREDIBLE. We loved it, it was such a fun experience, so relaxing and so interesting. You do not need to just love food to enjoy the tour, it was great any questions we had Salvo answered them. Any recommendations asked for Salvo helped us out. We are vegetarian and don't drink, we thought like normal food tours there would be items we would not be able to eat. Salvo made sure that there was a substitute even if just for us. We felt so special. We can not write words for how great and fun the tour was, it was supposed to last a few hours, without any complaints or ask for money the tour was extended and we all left with not only a full belly Arancini Ke Belly? but a new love for Sicily thanks to Salvo! 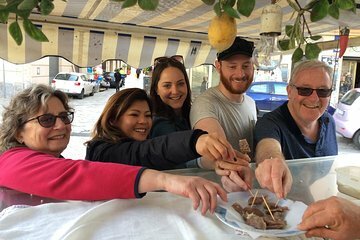 The street food tour gave us so much insight into the history of Palermo, it’s people and their food traditions. It was an excellent way to learn our way around old Palermo and Alessandra, our guide, was so delightfully fun and energetic! We highly recommend doing this tour as soon as you land in Palermo. I would highly recommend this absolutely fantastic tour. The guide was excellent and involved my son aged 7 in everything we did. 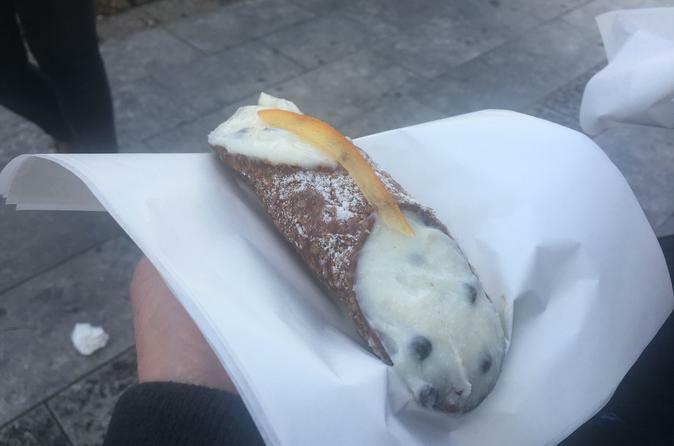 We did this street food tour the first day in Palermo and it helped us as we ate elsewhere. Not only with knowing what to eat, how to eat it, and where to eat it on the streets. But, also with restaurants for after the tour. I had the best seafood pasta thanks to their list or recommendations. This tour gives a great insight into the food culture and traditions of the Sicilian people. Our tour guide exuded passion for his great city! My husband and I had a wonderful time on this tour. It was our first day in Palermo, having arrived the night before, and it was the perfect way to get acquainted with the city. We got much more than a few tastings. We learned so much from our guide about the markets, and the lifestyle of Palermitanos. We recommend this tour very much! Our tour guide was excellent , we had a wonderful time and ate some interesting food. The tour laste about 3 hours and we walked through several local market areas to sample the food. A great way to navigate the food markets of Palermo. The guide was friendly and knowledgeable. The tour was long enough but not too long. Go hungry- there is a lot to taste.